Commonwealth Bay has since been described as "the windiest coastal place on earth"
As the expedition commander Douglas Mawson was himself a geologist, the examination of the accessible (i.e., not covered by ice) rock formations of Wilkes Land was a key feature of the expedition. The expedition is noted for having achieved the first discovery of a meteorite, a chondrite, 30 km west of Cape Denison. Over the following century a trove of meteorites have been discovered in this region of Antarctica. The location chosen by Mawson for the main base camp, at Cape Denison, proved to be one of the places on Earth with the strongest wind forces, with local morphology – the abrupt gradient between the East Antarctic ice plateau and the Antarctic Ocean – creating conditions ripe for the generation of near-continuous katabatic wind conditions. Robert Falcon Scott had considered taking wireless equipment with him for his ill-fated Terra Nova Expedition in 1910-1913, but had dismissed the idea because of the great weight of the entire transmission system. Prior to the AAE, there may have been wireless transmissions from ships at anchor at Macquarie Island, but as far as was known, no wireless messages had either been transmitted or received on the Antarctic mainland. To establish such a facility on the mainland would have been a major publicity coup for the expedition, while the further publicity value of realtime news from the Antarctic was great. The facility would also provide an opportunity to investigate for the first time propagation of radiofrequency waves in Antarctic environments. This was entirely consistent with Mawson's stated objective for the expedition to be principally one of scientific investigation. It must have been difficult for the expedition's promoters to announce close to the scheduled departure of the expedition that there was a £9,000 shortfall in funding and that if benefactors could not be found, it would be the wireless component of the expedition which would be omitted. Nevertheless, the funds were found and the stage was set for the Antarctic to be placed on the wireless map. Hannam was already prominent in the world of wireless at the time of his recruitment, issued with an early wireless experimental licence by the Postmaster-General. He was an associate of patriot Taylor and joined with him in early demonstrations of the potential of wireless to the Australian military. Hannam was a founding member of the Wireless Institute of Australia. He was personally recruited by Mawson as chief wireless operator for the expedition and advised him both on wireless equipment selection and wireless personnel recruitment. But after two summers and a winter in Antarctica, the big man had had enough, and having fulfilled his contract, in February 1912 returned to Australia. Sawyer was a Kiwi who had been earlier recruited by the Australasian Wireless Co., Ltd. as chief wireless officer for their new temporary coastal station at the Australia Hotel. Australasian Wireless would not have been unhappy for Sawyer to join the AAE, as it would have been concurrent with a decision to acquire two full 2 kW Telefunken transmission systems for the expedition. Sawyer's intimate knowledge of the Telefunken system would ensure the success of the venture and result in excellent publicity for their product and this proved to be the case. Sandell was less well known in wireless circles, but like Hannam, was a licensed wireless experimenter and they were well known to each other through their involvement in the Wireless Institute of Australia. A good steady hand, he alone of all the formally appointed wireless officers saw out the full two years of the expedition, albeit on the slightly less arduous Macquarie Island station. Jeffryes had been briefly a telegraphist with the Postmaster-General's Department, then was employed by the Australasian Wireless. It is not known whether he was engaged at Hotel Australia or on one of the ships fitted with Telefunken equipment. He had applied for one of the wireless positions in the initial voyage, but had not been selected by Mawson. But after Hannam's announced intention to return home, Jeffryes was selected by Davis as his replacement. For some months, he did good work, installing a new receiver for Cape Denison, recommissioning the antenna system badly wind-damaged and getting the facility fully effective for the first time. But he soon succumbed to Polar Madness and may never have recovered. Bickerton was a wireless officer of necessity. He was initially engaged as pilot and mechanic for the aircraft the expedition had brought with them. But when the aircraft was damaged beyond repair for flight, the unit was turned into an "air-tractor" and it fell to Bickerton to operate and maintain it. But as Jeffryes slipped into Polar Madness, Mawson sought Bickerton out, and instructed him to learn morse code and equipment operation alongside Jeffryes. Once Jeffryes was relieved of duties, Bickerton then well filled the wireless operator role. The AAE expedition was the first Antarctic expedition in history, and the only one during the Heroic Age of Antarctic Exploration, to maintain radio contact with its country of origin. Only a high power facility of comparable capacity to those recently established at Sydney (VIS) and Perth (VIP) would have been capable of direct communication between Hobart and Cape Denison and this would have been prohibitively expensive and resource hungry for the expedition. It was decided to establish an intermediate station at Macquarie Island, and by halving the maximum distance for each signal to traverse, it was expected that the 2 kW Telefunken transmitters of the Australasian Wireless Co., Ltd. would enable reliable communication. The Aurora carried a Marconi wireless set and another was set up at Cape Denison, but due to the competitive nature of Antarctic exploration at the time transmissions were kept to an absolute minimum. The equipment used was a 1.5 kW Telefunken spark transmitter and a flat top antenna. Atmospheric conditions associated with the Aurora Australis interfered with radio transmissions on many occasions, but the expedition parties were generally able to receive news from the outside world reasonably regularly via the relay station on Macquarie Island. Prior to the departure of the expedition, Mawson was making representations to the Postmaster-General to prioritise the establishment of the Hobart station (subsequently allocated callsign VIH) in the network of coastal stations which were finally to be established after a decade of delays and several shipping calamities. These representations appear to have ceased once it was realised that the Macquarie station could communicate with the Australasian Wireless Co., Ltd.'s temporary station at the Hotel Australia. While the Australian Government dithered on the establishment of a network of coastal radio stations, Australasian Wireless Co., Ltd. was granted a temporary licence and a Telefunken system was promptly installed on top of the Hotel Australia and gave sterling service. Once the Macquarie Island station was commissioned, it was with Hotel Australia that the first messages were exchanged. Sawyer, the chief wireless officer at Macquarie Island, was immediately prior to the expedition, the chief wireless officer at Hotel Australia. Thereafter we hear no more of representations by Mawson and the AAE for prioritisation of the VIH coastal station. By the time of the AAE, wireless installations on ships of the British Navy on Australia Station were ubiquitous. Despite being a mobile facility, good power supplies were available and the larger vessels provided sufficient on deck space for provision of efficient antenna systems. The range of the ships while at harbour was no different to that of a moderate power coastal station, while at sea, the superior propagation over salt water resulted in ranges equal to high power coastal stations. While little mentioned by Mawson, he would have been advised by Hannam that Macquarie Island would be able to stay in contact with the naval shipping and this proved to be the case. Mawson's interest in the Australian coastal stations would have been driven primarily by the Navy's likely desire not to be an intermediary in high volume traffic. ^ National Research Council (U.S.), Pola Research Board (1986). Antarctic Treaty System: An assessment. National Academies. p. 96. ^ "Polar trek made to measure where Mawson team made mark". The Age. 30 September 2013. ^ "100 years of Australian Antarctic Expeditions". About the centenary. Department of Environment. Retrieved 13 June 2014. ^ Yates, Peter. "Australia continues as telecommunications innovator". Australian Antarctic Magazine. Spring 2001 (2). Retrieved 13 June 2014. ^ "Video Overview The Official Film of the Mawson Antarctic Expedition (c1916) on ASO – Australia's audio and visual heritage online". Aso.gov.au. ^ "Home of the Blizzard". Petermorse.com.au. ^ Roberts, David (January 2013). "Into the Unknown". National Geographic. Retrieved 29 January 2013. ^ "Antarctic Explorers: Douglas Mawson". South-pole.com. Retrieved 18 January 2012. ^ "Sir Douglas Mawson (1882–1958)". About Antarctica. Department of the Environment. Retrieved 13 June 2014. ^ Bickel, Lennard (2000). Mawson's Will: The Greatest Polar Survival Story Ever Written. Hanover, New Hampshire: Steerforth Press. ISBN 1-58642-000-3. ^ Sears, Derek (22 March 1979). "Rocks on the ice". New Scientist. 81 (1147): 959. ISSN 0262-4079. ^ "Cape Denison, the birthplace of Australian Antarctic expeditions". AusGeo News. Commonwealth of Australia. December 2011. Retrieved 13 June 2014. ^ "SOUTHWARD HO!". Evening News (13, 528). New South Wales, Australia. 18 October 1910. p. 5. Retrieved 18 April 2018 – via National Library of Australia. ^ "The World's News". The World's News (511). New South Wales, Australia. 30 September 1911. p. 15. Retrieved 17 April 2018 – via National Library of Australia. ^ Taylor, Stanley Gordon Roberts. "Antarctic Diary". Stanley Gordon Roberts Taylor's diary of his 1912–1913 voyage to Antarctica with Sir Douglas Mawson's Australasian Antarctic Expedition. Taylor family. Retrieved 7 April 2014. Benham, William Blaxland Shoppee (1921), Polychaeta, [Sydney] : Australasian Antarctic Expedition. Davis, John King , With the "Aurora" in the Antarctic 1911–1914, London, Andrew Melrose Ltd.
Day, David (March 2013). "From Cecil, with Loathing: 'Madigan's Account: The Mawson Expedition'". The Monthly. Khler, René (1922), Echinodermata Ophiuroidea, Sydney : Printed by John Spence, acting government printer. 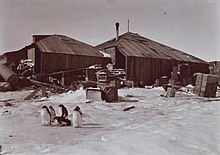 Mawson, Douglas (1915), The Home of the Blizzard; Being the Story of the Australasian Antarctic Expedition, 1911–1914, Philadelphia, Lippincott. Mawson, Douglas (1918), Scientific Reports: Vol. 3, Pt. 1–6, Sydney: Govt. Printer. Bickel, Lennard (2000). Mawson's Will: The Greatest Polar Survival Story Ever Written. Teerforth Press. ISBN 1-58642-000-3. Wikimedia Commons has media related to Australasian Antarctic Expedition. Mawson and Mertz: a re-evaluation of their ill-fated mapping journey during the 1911–1914 Australasian Antarctic Expedition – examining the Vitamin A poisoning hypothesis. Wireless Hill is a steep-sided hill with a summit plateau that takes up most of the North Head promontory at the northern end of Australia’s subantarctic Macquarie Island, lying in the Southern Ocean about halfway between Australia and Antarctica. Its highest point is about 100 m above sea level and it is joined to the main body of the island by a low and narrow isthmus that is occasionally wave-washed in heavy storms. Macquarie Island Station, operated by the Australian Antarctic Division and the only permanently populated place on the island, lies at the northern end of the isthmus at the foot of Wireless Hill. The hill is so named because it was the site of an early wireless telegraphy relay station, part of the first radio link to Antarctica. The Hannam Islands are three small islands lying in the eastern part of Commonwealth Bay, Antarctica, midway between Cape Denison and Cape Gray. They were discovered by the Australasian Antarctic Expedition (1911–14) under Douglas Mawson, who named them for Walter H. Hannam, a wireless telegrapher with the expedition. John Hamilton Blair was a Scottish mariner, who was first officer aboard the SY Aurora during the Australasian Antarctic Expedition in 1913-14. He later served in the Royal Navy during the First World War, where he was awarded the Distinguished Service Cross, as the head of Pangbourne Nautical College, and returned to the Navy during the Second World War. Percival Gray was an English sailor. During his early career he served on the Worcester and the Archibald Russell, and then joined the New Zealand Shipping Company. From 1909 to 1911, he worked for the Peninsular and Oriental Steam Navigation Company. During this time he attained his First Officer's certificate. From 1911 to 1914, during the Australasian Antarctic Expedition (AAE), he served as Second and navigating Officer aboard the SY Aurora, under John King Davis, for all five cruises.